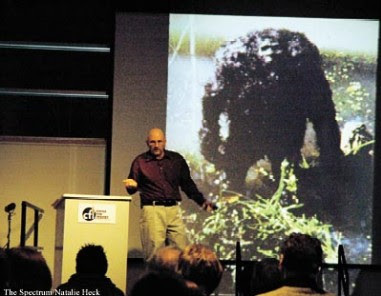 In an open letter to The Bigfoot Lunch Club, David Rodriguez, a speaker at the Oregon Sasquatch Symposium defends Cliff Crook--or at least he claims we should not be so quick to judge. We have been public regarding our criticism of Crook, some would even call us down right dismissive. Without further ado, lets get to the compelling letter submitted to us by Mr. Rodriguez. There's been a few mentions on blogs about Cliff Crook over the years. And with the latest, I feel its an opportune time to dispel some innacuricies floating around out there. As many know, I have recently been looking into another individuals outlandish claims from deep in the land of Sylvanic. Now I think it's time to pursue the truth in a different direction. I don't see Cliff Crook fitting in the negative light that some have painted him in. I suspect that much of what has been said about him was initially born out of animosity within the field by a few, animosity that sometimes gets out of hand, and then the rest just assume the assertions to be the truth because they have a louder bullhorn. Well, this time I'd say its the criticism that is unfairly derived and poorly corroborated with any form of evidence. So why do some consider the Wild Creek Photos to be a hoax and therefore Mr. Crook to be a hoaxer? This is one of the most screwed up conclusions I have seen in this field. The most popular reason people give is that its a small action figure made up to look like a bigfoot. We can see it repeated over on Cryptomundo right now and in many a blog or forum commentary. Well, everyone can write that unsupported explanation off their books! Cliff has been given a bum deal all these years by certain people in the bigfoot community. Sure there may still be questions about the photos, but I have a feeling he would have good valid answers, if people just asked before prejudging them. I've closely looked at a few photos in the sequence and I'm pretty confident about the following. So its time to blow the 'small action figure' allegation out of the water. You see those tiny white spots in the water? 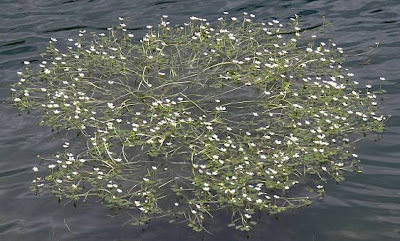 That appears to be one of a few well known aquatic plant species, such as White Water Crowfoot, Water Buttercup or Fanwort. They each grow in slow moving streams or in ponds throughout the US and Canada. 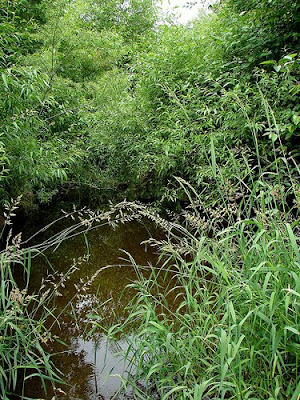 I see it in the rivers and ponds where I live here in Oregon, which is how I first recognized it in the photos. I also have some background in waterway ecosystems having once pursued the construction of a fresh water interpretive center. Depending on species, the size of the flowers (1/2" - 3/4") then provides some scale to the photos. Then I've read where people comment on the size of the grass as the reason why it must be a small action figure too. Well once again, that's a baseless and innacurate conclusion . That isn't lawn grass people! The grass in question is likely a well known invasive species called Reed Canary Grass or Phalaris arundinacea. The species grows very well along the water's edge and can reach 6' in height. It is possible that its a plant variety known as Rush if I see a bulb in the photo, but without more detailed images, its difficult to tell for certain. http://plants.usda.gov/java/profile?symbol=JUNCU Either way, other items in the photo combined provide an even better idea of scale, and in fact they would support each other's scale. Here we have two good biological reasons to rule out claims of it being some little action figure or that "forced perspective" was used. I can say without hesitation that the figure is larger then a human. There are other plants and leaves in the photos, and if their species was identified from better quality photos, they would provide additonal validation to size and scale of the central figure. I've never looked at his original 35mm photos, but those I've been able to find a few online over the last few years that certainly don't automatically conclude hoax, despite what some forums and bloggers have repeated. I once posted some of this information about the aquatic biology over on BFRO in a thread there about Cliff, but this information was soon deleted from that thread. That didn't impress me in the least. Why would BFRO remove legitimate information about the surrounding biology visible in those photos? When an organization does that, then I cannot help but question if they are truly unbiased in their research. I guess I can say this now because I've also been removed from their elitist sometimes misinformed forum. (Oh and their Snow Mound mystery, is nothing more then decaying woody debris from the nearby dead stump that fell on the then deep snow and was subsequently torn apart by animals looking for grubs in the Spring. The decaying somewhat dispersed chunks then acted as insulation from the sun, leaving a mound of snow beneath. BFRO, do your own experiment validating this, but you have to be careful to not compact the snow too much around the decaying log.) Anyway, there is definitely a long-term animosity existing between Cliff Crook and Matt Moneymaker. Both Mr. Crook and Mr. Moneymaker have documents online about one another. I think part of what we really have here is animosity between two individuals that goes back many years, and its silly. From what I have read, some of it stems from Cliff Crook alleging that he could see a zipper fob on Patty's waist. Well I don't agree with that either, and even if Cliff Crook and Chris Murphy did identify something in the Patty images, it could have another plausible explanation that they didn't fully consider. What if it was simply some human object of adornment, (like a hair clip) that Patty found and attached to herself? Sure, some may not accept this either, but these sasquatch have and do many things we don't understand. Heck, some even claim that sasquatch use braiding. What gall! lol The fact is, we don't know much about sasquatch behavior, and in fact they are often viewed as part human. So why not be some kind of manmade object she found and placed there by Patty herself? So it may be that Cliff needs to revisit some of his statements as well. He also stated that the the Skookum Cast is hoaxed, well I think things just got out of hand in discrediting one another between BFRO and himself on that one. Cliff, you know that sasquatch are intelligent enough to avoid making tracks in a mudpit, especially when people and their scents are present, that's for sure. It would seem that Cliff paid good money for the 14 images from the off-duty forester, and they were erroneously and prematurely shot down by the masses. And people, you can't judge a person by their last name either! Isn't that right Matt? That is just immaturity at its worst and has nothing to do with a person's character. Those 14 photos may very well be the real deal folks. Unfortunately it's become a sad circle of animosity by some bigfooters that prevents a valid assessment. Therefore we all lose! I should also say that I met Mr. Crook once back in the mid 1980's. He had a booth at the Oregon State Fair up north in Salem. I had personally seen my first sasquatch years earlier and so did have an interest in the subject even though it was nothing like now. From what he said back then to what his website shows now, he was a sincere bigfoot enthusiast. http://www.angelfire.com/biz/bigfootcentral/index.html He didn't make outlandish claims like another person I have come across. Cliff appeared to be woods savvy too, something that the armchair researchers lack. I even bought a cast from him for like $5 or $15, I can't remember. I still have it too. Sure I have some questions about that cast, but it looks real, as far as sasquatch casts go. He also gave me copies of some interesting written materials. One being a letter from then Washington Governor Dixie Lee Ray which validated that some of Mr. Crooks efforts were clearly principled and altruistic for the time. I simply haven't written Mr. Crook off as a hoaxer like a few have, and I wish I could have viewed his original photos more closely. We know that 35mm prints can't be manipulated like digital photos can, so his original prints and negatives may hold much more information then we realize. I had tried contacting him a year or so ago when I posted the related items at BFRO, but I think Cliff finds it hard to trust people in the field anymore. That's understandable I suppose but I wish he didn't feel that about me because I really was looking for the truth in those photos. I've had more then my share of encounters with these creatures, so at least I look at things with a level of belief and knowledge that the skeptics or armchair researchers don't have. I think what some of these people say about him is discourteous and without merit. It stems from those who either had a hidden agenda, or who never will have any kind of encounter while sitting at their computer. 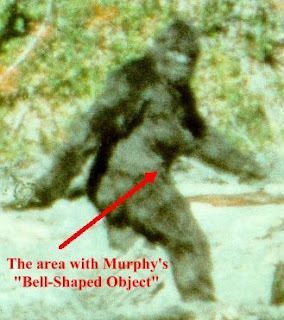 My assessment is, we're overlooking, even discrediting, some fairly good photos of a sasquatch and now we've all lost. I have to wonder if any of the detractors of his EVER analyzed the photos in true detail? I kind of doubt it. While it may not matter to Cliff anymore what others think, this photo evidence definitely deserves a second unbiased look. From the beginning he stated that he bought them from a forester who did not want to reveal his name publicly. We know this is highly plausible as well, given the stigma people feared would be attached in their jobs, along with the fear of losing employment. If it was an 'off duty forester', it was then likely a government employee. Well, 10 years ago timber still ruled, so what other response would we expect? But what if now this forester is retired and willing to come forward to take credit for taking the photos? Sadly with the way this field sometimes behaves, can you blame him for not doing so in the past? I suspect Mr. Crook is just like many others who have been in the field for a long time. He's had his independent ideas, and some of them went against the grain. Big deal, I have a few of my own that have yet to be shared. I think too many baseless accusations have been thrown around about Cliff. If Cliff wanted to share his evidence again with a proper biologically-educated group of people, he could probably emerge with his researcher reputation in good standing. I suspect he already has a good reputation with those who know him personally. Unfortunately many individuals are at odds with Mr. Crook because of the past Patty and Skookum Cast controversy, and it seems this will prematurely influence at least their unbiased consideration of any evidence. So is it safe to say that some people will always be biased towards Cliff for purely unjustified reasons? Will Cliff ever be able to admit that he could also have been wrong in his claims about Patty and the Skookum Cast? Hopefully we don't have two old rocks that just won't budge. Cliff has indeed been around a long time. His early encounters are also believable and often the norm for encounters in the woods. His ideas about sasquatch even back when I met him were what I can accept. Well, what I can remember anyhow. He was a technical advisor and even portrayed in the movie 'Harry and the Hendersons' as I understand it. While there may be a few issues that need addressing, I think Mr. Crook was unfairly treated by this often insensitive misinformed field, where forums will hang a person simply because a few of the vocal individuals lead the way. It's Groupthink at its worst in an online setting. And while it may seem I'm singling out another individual right now (Todd Standing), a lot of research went into that issue, plus its been boiling over in forums for 5 years now. 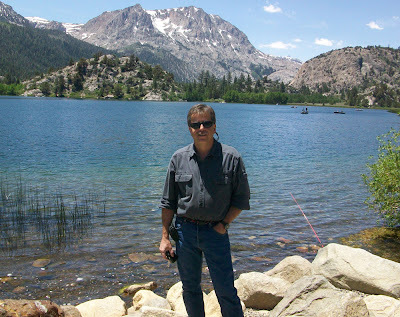 Back to the photos, granted, the alleged bigfoot in them is pretty damned ugly. But that isn't a reason to rule the photos out as being non-authentic either. It also doesn't rule out that he could have been hoaxed by someone other then Cliff who saw opportunity, but I don't think that's the case either because of the overall content within said images. 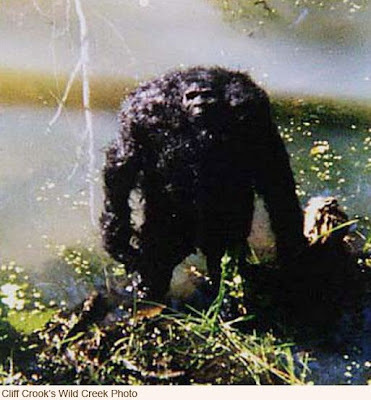 From what I've read in reports, sasquatch can be as varied as we are in their looks and appearance. 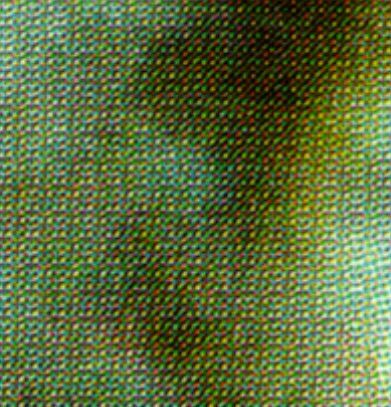 So yes, it is possible that Cliff may have 14 very good images of a very ugly bigfoot. lol I'd want to have a better look at the photos myself to see what else can be identified. Cliff if you are reading this, maybe this is something you would allow? And no, being willing to investigate something, doesn't 'allign' oneself with a person, as I have seen asserted with other people. If it requrired a few botanists to personally identify all the vegetation in the photos and write this up, well that's probably doable too. I don't have some preconceived notion Cliff is a hoaxer like some have done. In fact I see many elements of validity in the photos, and I can also separate those other past issues of controversy as well. Too bad some people can't. People too often draw conclusions before they actually investigate the details of a claim thoroughly. There are definitely jealousies and animosities within this field, that's for sure. I've long had this unnerving feeling that Mr. Crook may have gotten a bad rap over the years and even I am guilty for not speaking out even though I tried at BFRO. Even I was afraid to go against the norm however. Well, screw that! Unfortunately when you do speak out in blogs, there are even one or two bloggers in this field who selectively choose whose points of view they will allow. That blogger knows who I am talking about and I won't enter that issue any further for now. I'm after the truth, and with the Wild Creek Photos, I've seen inconsistencies in the claims from the critics of the photo evidence, instead of from the person claiming them to be authentic. As to whether he was the first bigfoot researcher, that's hard to say because there was no internet back then. Does anyone have knowledge of someone else to be doing it longer then Cliff? There probably have been 'people' going back a long time before, who saw something and tried to understand it. Do we call them 'bigfoot researchers', probably not. Frankly, Cliff needs to be heard out before we allow the image builders/takers in this field, with their own unsubstantiated preconcieved ideas or agendas, to tear him down. Cliff has a theory about the Paluxy tracks. I'd think Jeff Meldrum would have an open mind as well, since he knows better then most what its like to go up against the typical brick wall of closed-mindedness. Too bad Mr. Meldrum couldn't have a look at the actual impressions himself. Obviously he was illinformed about cast separation methods in hard rock, so maybe he too should keep an open mind? Who was around when the tracks were made and can dispute their authenticity first hand? Nobody! There's much that science assumes to be the way it is because it is what young scientists were taught in school. Well, they weren't taught that bigfoot existed either and guess what! If religious belief is the reason for discounting the tracks prematurely, well then I ask what that has to do with science? The rules of hominid evolution have been broken time and time again. There is no question that these sasquach are a very capable species too, look how they've survived and evaded us. So who decided when they first came on the scene? 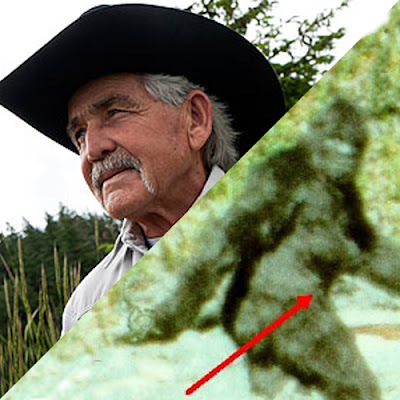 Well, Cliff has at least earned some respect for his years of bigfoot research. I think we owe him that much. This is his passion just as it is ours. So let's at least hear him out before throwing the baby out with the bathwater like some always do. I think it ironic that some treat others within our field in the same way we criticize those outside it for treating us. Maybe its time we learn something from our own observations.